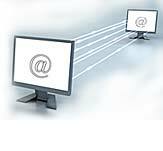 McCookNet Internet Service is a shared bandwidth service meaning you are not buying dedicated speed. The service speed is burstable up to the amount you are paying for. IT DOES NOT MEAN YOU WILL HAVE THAT SPEED AT ALL TIMES! In order to provide all members with fair and equal use of the McCookNet service and to enhance the Internet access experience by preventing unacceptable use, this Acceptable Use Policy (“AUP”) has been created. This AUP governs use of the McCookNet Internet access service (the “Service”) for residential consumer use. The Service is designed and engineered for periodic use of e-mail, newsgroups, file transfers, Internet chat, instant messaging, non real-time interactive games and browsing the World Wide Web. IT IS NOT DESIGNED FOR CONTINUOUS STREAMING OF AUDIO OR VIDEO CONTENT AND WE MAKE NO GUARANTEES USING THESE SERVICES. ALSO USING THESE SERVICES CONTINUOUSLY IS A VIOLATION OF THIS POLICY! It is your responsibility to ensure that your activity does not impose an unusually large burden on the McCookNet network or otherwise negatively affect the integrity of the system. Your activity also must be respectful of, and must not have a negative impact on, the online experience of the rest of the McCookNet member community. The Service currently is designed for efficient use in residential applications. It is intended for use with, bandwidth consumption by and support of a single personal computer connected directly to the McCookNet network. McCookNet call center support is limited to this single PC and will not be extended to other computers should they be networked in such a way as to utilize the Internet access provided by McCookNet. If other software or applications residing on a member’s computer restrict or inhibit the ability of the McCookNet software to function properly, the offending software must be removed prior to the member’s seeking call center support. To help ensure that all members have fair and equal use of the benefits of the Service and to protect the integrity of the Service, McCookNet reserves the right, and will take necessary steps, to prevent improper or excessive consumption of bandwidth used to provide the Service. You should be aware that the networking of additional computers to access the Service may result in such excessive bandwidth consumption. The action that McCookNet may take includes, but is not limited to, limiting any excessive throughput, discontinuing service via specific ports or communication protocols, and a complete discontinuation of service to the member with improper or excessive bandwidth consumption. This policy is effective and will be enforced for intended and unintended (e.g., viruses, worms, malicious code, or otherwise unknown causes) bandwidth consumption. Your on-line activity will be subject to the then-current bandwidth, data storage and other limitations of the Service, which McCookNet may, from time to time, revise in its discretion and without providing advance written notice. McCookNet reserves the right to implement technical mechanisms which block postings and messages which, in McCookNet’s sole discretion, violate this AUP before they are forwarded or otherwise sent to their intended recipients. McCookNet also reserves the right to take such action as may be necessary to protect the integrity of the system, including, but not limited to, regular system monitoring, as well as port scanning and shutting down of ports affected by viruses, worms or other malicious code. Nothing contained in this policy shall be construed to limit McCookNet’s rights or remedies in any way with respect to any of the foregoing activities, and McCookNet reserves the right to take any and all additional actions that it may deem appropriate with respect to such activities, including without limitation, investigating suspected violations of this AUP, taking action to recover the costs and expenses of identifying offenders and terminating their access to and use of the Service, and levying cancellation charges to cover McCookNet’s costs in the event of termination of access to the Service. In addition, McCookNet reserves at all times all available rights and remedies with respect to such activities at law or in equity. This AUP may be clarified or modified periodically. Any member who does not agree to abide by all of the terms of this AUP should not continue to use the Service. If you would like to report any activity you believe to be a violation of this AUP, please direct such information to McCookNet’s Abuse Department, at abuse@McCookNet.com. "Microsoft is a registered trademark of Microsoft Corporation in the United States and other countries."